One of my friends shared these pictures of Beatrix Potter nursery murals that she had painted and I thought that others might enjoy the paintings. The photos are so amazing and depict the bunny rabbits and other characters so beautifully. It's so easy to peel and stick wallies and decals that not many moms take the time or have the artistic talent to paint their own Peter Cottontail, Flopsy and Mopsy wall art. I can't make a decision as to whether the pictures of the bunnies in the painting or paintings of Jeremy Fisher and Jemima Puddleduck are my favorites. 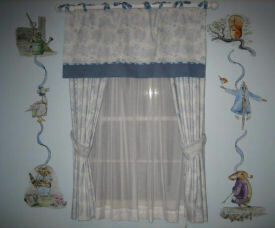 Or as in the case with this room, it may be the combination of the two that make a Beatrix Potter nursery so charming. I have loved the story of the bunnies in Beatrix Potter's storybooks since I was a little girl and am looking for vintage wallpaper that has something similar to a toile pattern featuring the characters.